Last week was excellent from the weather point of view. 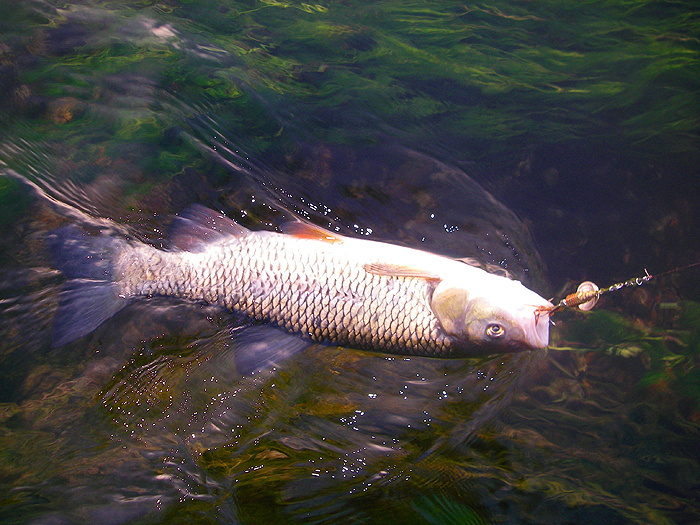 As a result the local rivers, already low, clear and warm, can be tricky fishing. In addition the banks of many running waters are heavily overgrown with nettles, thistles, reeds, Himalayan balsam and a host of other tall, lure catching plants. I still like to do a spot of spinning, preferably in the early morning or evening, but it can be hard going and if at all possible it is best to get in there and wade. Of course you have to be suitably dressed for the job, chest waders are best, and you should always be careful where you tread as even when it seems shallow there can be sudden drop offs, stones to stumble over and beds of clinging, tripping weed. Wading has two major advantages. Firstly, from mid river you can easily cast to any point on either bank and secondly, there are a lot less stems and leaves to get in the way of your rod tip. Of course if you're in the water inevitably you will make waves so it pays to move slowly, particularly as you approach likely holding spots. I prefer to work my way upstream casting ahead of me. The line is twenty pound Nanofil with a short trace of clear Amnesia and an even shorter length of knottable wire (there are pike everywhere). To come to the point, a couple of days back I went for an hour in the evening to a stretch belonging to Wimborne and District A. C. It was still pretty bright and the sun was shining so I wasn't too hopeful but it was nice to be out. I clipped on a black and silver J9 Rapala and began to work my way upstream. For ten minutes I saw nothing, then I came to a spot where the river has cut a two metre deep hole under a small willow bush. 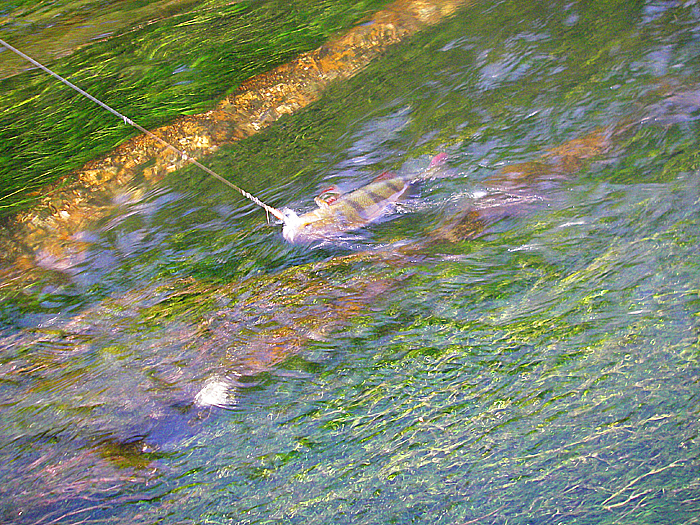 There's a strong flow under the bush and it's critical to drop the lure upstream of the twigs and bring it back through the deeper water, as close as possible to the overhanging vegetation. There was a nasty little breeze blowing towards the bank and on my first cast I didn't allow sufficiently for it and the plug dropped into the branches. A smart flick of the rod dislodged it and it plopped back beside me. I wound in for another go and this time I allowed a bit more room. Wrong again! This time I was really hung up, there was no way that the lure was going to come free. 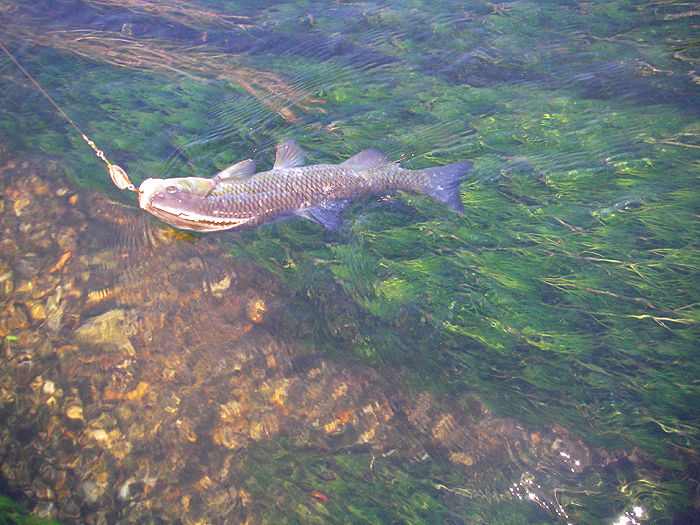 I muttered a few choice words as I waded towards the snagged lure. It was too deep for me to get to the lure so I had to pull and the line pinged and broke leaving my plug in the bush. I paddled back downstream to a dry bit of bank where I could do a running repair with a new trace and a replacement lure. I didn't have another J9 in the bag so I switched to a size 4 silver Mepps. Curiously, by the time I'd set my gear up again the gusty wind had dropped, as it often does on a summer's evening. I assumed that my attempts at retrieving my lure had scared any fish in the hole but when I was close enough I cast past the willow again. The spinner dropped perfectly a couple of metres upstream of the bush and I began to wind just quick enough to keep it spinning with the flow. As it came past the overhang it was grabbed by a fish which immediately splashed on the surface like a trout. I steered it away from the snag and realised that it was a chub of perhaps two-and-a-half pounds. Excellent. At least I wasn't going to blank. I took a couple of pictures before I unhooked the fish and as I released it. It swam away strongly. Encouraged by the modest success I continued on upstream until at the head of the shallows the river became a deep, sluggish, treelined pool. I know from experience that there are often jack pike in the slower flowing water so when my second cast upstream was met by a sharp tug, that's what I expected. 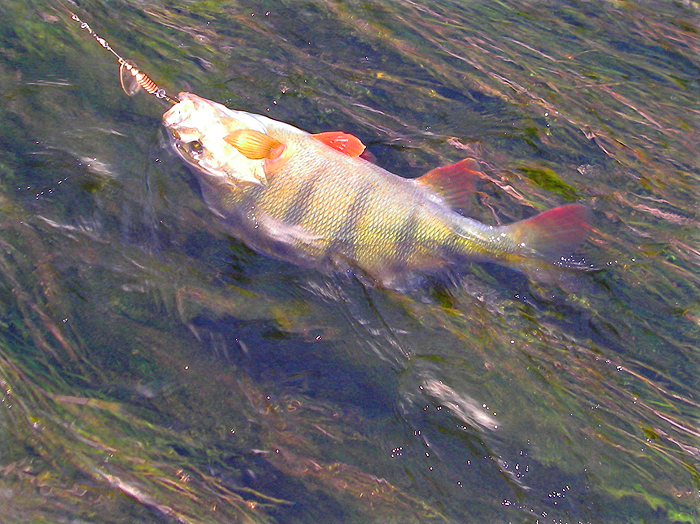 However, the bumping, tugging battle suggested it was a perch and sure enough a nice stripey specimen of about a-pound-and-a-half was soon swimming in the shallows beside me. Another couple of pictures and I was able to release my second fish of the session. Two more casts straight upstream and I was into a second, much smaller perch. I couldn't go any further so I set off back downstream. As I passed the offending willow bush I looked for my plug and could just see a piece of nylon dangling down - it was my trace. Could I reach it? I waded as close as I dared then poked the rod out towards where I thought the Rapala was hanging. After a couple of swishes with the rod top I managed to pick up one of the trebles in the tip ring. Now what? Stupid man! I pulled straight back with the rod and managed only to dislodge the top joint which was hanging from the tail treble of the plug. Tricky! By leaning forward I could just get hold of the end of the top section of rod. I gently pulled and, miracle of miracles, the lure came free and remained hanging on the rod. Bonus!. If I'd filmed the farcical goings on and put them on the internet I expect it would have gone viral. I thought that must be my share of good luck for one session but no, I had one more perch and lost a half decent trout before I packed in and went home. All very enjoyable. The chub. A bit of a tatty fish but very welcome. The fish is well hooked on the size 4 treble. The best of my perch struggling in the shalow, fast flowing water. Closer. again nicely hooked on the Mepps.